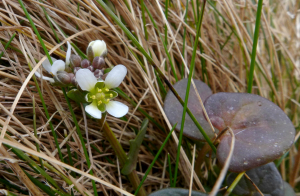 Observation - Scurvygrass - UK and Ireland. Description: The flowers taste OK, the leaves are awful! The whole plant is behind this year - 10 days without rain and wind-chill often minus 1. The flowers taste OK, the leaves are awful! The whole plant is behind this year - 10 days without rain and wind-chill often minus 1.